In these waning days of summer, my Instagram feed looks like a Lonely Planet top 10 list. I don’t know how, but it seems like the 300+ people I’m following have all conspired to be someplace awesome, while I’m toiling away in the office. It can feel frustrating when it seems like everyone (except for you) is having the time of their lives – and bragging about it online. A new survey, conducted by Harris Poll on behalf of the AICPA, found that when it comes to feeling envious on social media, I’m far from alone. In fact, many Americans are caught in a cycle of feeling jealous of friends who post about their lavish vacations and extravagant purchases, while admitting that they also post things solely because they are fancy or expensive. I don’t always get mail, but when I do it’s usually a credit card offer. And these cards are often tied to a particular hotel chain or airline. Many of these offers tout initial low-APRs, a waived annual fee and, increasingly, an obscene amount of rewards points – enough for a ROUND TRIP flight!!!! - if I only spend a few thousand dollars in the first couple of months. However, my wife and I have been diligent about putting all of our charges on a credit card with a rewards program for a particular hotel chain and booking rooms at this brand whenever possible. The last thing I want is to lose our status with that chain by spreading ourselves too thin. This approach is working for us; over the past few years alone, we’ve paid for hotels in Denver, Boston, Puerto Rico, Baltimore and New Orleans using our rewards points. I’m by no means an expert travel hacker – that is, someone who has mastered collecting rewards points to earn free travel – but I’m making sure the money I spend on my card and the trips I take is working to my advantage. Seems simple, right? Fueling the Accounting Profession Pipeline: What Will it Take? 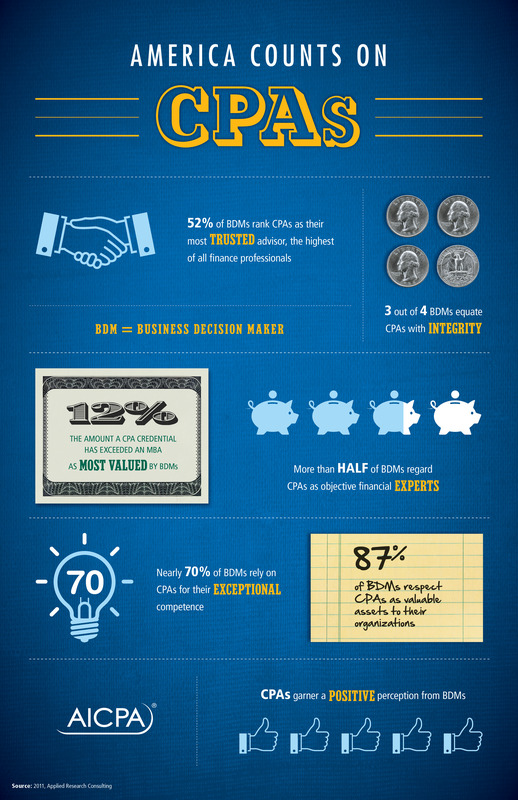 Developed by the AICPA, this updated infographic highlights the role CPAs play in business and financial decisions. From Main Street to Wall Street, CPAs are the most trusted and objective financial experts. The below infographic has been updated with recent data. In 2008, the AICPA Professional Ethics Executive Committee and the AICPA Professional Ethics Division undertook a project to update the AICPA Code of Professional Conduct. The new code has been launched this week. Help us spread the news by sharing this infographic! The AICPA’s Legacy Scholars Program, which awarded more than $370,000 in scholarships in the 2013-2014 academic year, has announced that applications are now live for 2014-2015. The application deadline is April 1 for the four scholarship programs that comprise the AICPA Legacy Scholars Program. In addition to financial assistance, the scholarship recipients gain real-world experience and develop the skills employers want to see. Check out the infographic below for more information on the program. According to a new survey conducted for the AICPA by Harris Interactive, only 39% fully understood the burden student loan debt would place on the future and 60% have at least some regret over the choice of education financing. Furthermore, 75% have made a personal or financial sacrifice--such as delaying a home purchase and postponing marriage and children--because of monthly student loan payments. The press release includes tips for parents and students on both saving for college and managing loan payments. The below 360 Degrees of Financial Literacy infographic, Realities & Regrets of Student Debt, highlights the findings. It seems you can’t turn on the news without hearing at least one story about money. Saving, spending, debt, budgeting…the topic of finances is everywhere, except, however, in the homes of consumers. According to a recent Harris Interactive survey conducted on behalf of the AICPA to promote the new consumer book Save Wisely, Spend Happily, only 14% of Americans identify financial problems as something they would feel comfortable discussing. What’s more, 28% say they have no one to ask for financial advice. When it comes to family and finances, shouldn’t loved ones be allies? 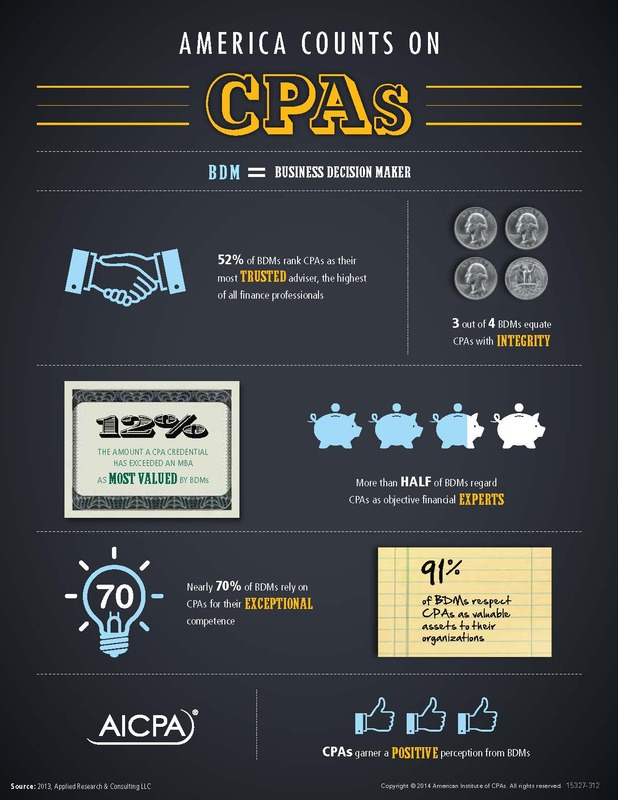 Developed by the AICPA, this infographic highlights the role CPAs play in business and financial decisions. From Main Street to Wall Street, CPAs are the most trusted and objective financial experts. Download a high or low resolution image and share this infographic. According to the Digital CPA Survey, released over the weekend at Digital CPA: 2012 CPA2Biz Cloud User Conference, an overwhelming majority of CPAs say they have a role to play in technology adoption for their clients. Only 17% of CPAs say they play a minimal role or no part in helping clients embrace cloud, mobile and other emerging technologies that can improve business decision-making. Based on the survey results, the following infographic was developed (click on the image to make it bigger). Feel free to share with others. What is a 'Digital CPA'? Service Organization Controls reports are designed to help service organizations, organizations that operate information systems and provide information system services to other entities, build trust and confidence in their service delivery processes and controls through a report by an independent Certified Public Accountant. Each type of SOC report is designed to help service organizations meet specific user needs. This infographic explores the transition from SAS 70 to SOC reports and how they apply. The AICPA, in partnership with the Ad Council, launched the next phase of its award-winning Feed the Pig campaign with the release of new public service advertisements. The new PSAs promote the key message: “Put away a few bucks. 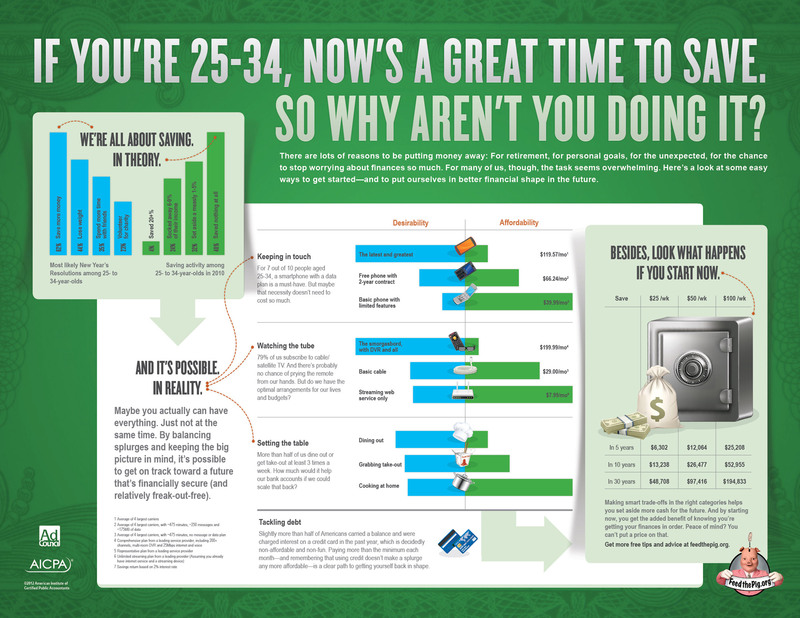 Feel like a million bucks.” In connection with the new PSAs, they also created this excellent infographic highlighting tips on saving money. DailyInfographic.com even picked it up. Click on the image to enlarge.